For Shae Parsons-Wanoa studying communications at AUT is a bit of a family tradition. “AUT is somewhat of a family choice, and I’m the fourth AUT communication studies graduate out of my siblings. I was raised to always think outside the box, or even better, to think of a new box altogether. AUT embodies this, not only by teaching applicable subjects and courses, but by taking bold moves and forging a new path that older universities end up following. AUT has been hugely supportive every step of the way, says Shae who received a Significant Student Scholarship to support her studies. Her biggest highlights at AUT came from outside of the classroom, Shae says. “The highpoints for me included working as a media intern for the New Zealand Fashion Week and participating in the BizTech Labs Competition 2018. I was also an event co-ordinator for the AUT Scholars Society, which won the AUTSA Community Engagement Award for 2018, and was involved in planning and organising a university charity ball for the AUT Scholars Society. 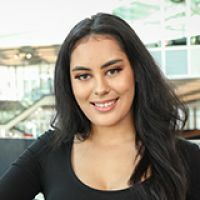 This year, Shae gets to apply the skills she developed on an international stage – through the AUT Internz International Scholarship Programme she is currently interning for international communications and PR agency Baldwin Boyle Shand in Singapore. Her internship will help her stand out in the increasingly competitive job market, Shae says. There are too many people pushing an image to employers that is generic and not authentic, Shae says. “My biggest piece of advice would be to figure out your strengths and weaknesses – and this takes some serious reflection, which isn’t always the most pleasant activity – and then build a personal brand off what you can offer.